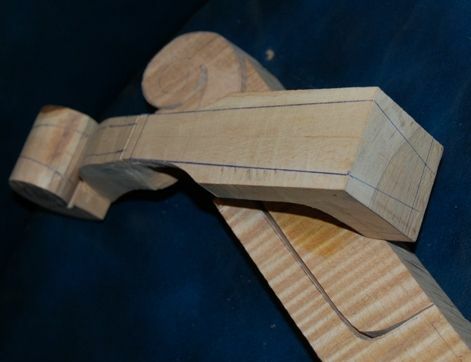 Violin neck billet with profile laid out. Notice that the pegbox is a little shorter, because it only has to accommodate four strings. I use a band-saw to cut out the profile of plates and necks. I do have a bow-saw that I made for such work, and I can use it if need be. but I find the bandsaw so much easier to control and so much faster, and the results are so much better, that I quit using the bow-saw after about two instruments. It looks nice, hanging on the wall. Power Tools vs. Hand Tools? Some people are insistent that the “only right way” to make a hand-made instrument is to use nothing but hand-powered tools. I have built one instrument using only hand tools. I will probably never do so again. There is a reason that bandsaws, drill presses, etc were developed: they not only save wear and tear on your body, they do better work, as a rule. Can they cause damage? Absolutely. So can any tool. I use a practiced eye and steady hand to guide the billets through a bandsaw. I complete all the carving of each hand-carved instrument using gouges, planes, chisels, and scrapers. Here’s that same violin neck billet with the side profile cut out. I have a table of measurements I use, to lay out the front and back lines of the scroll and neck. The top of the neck is just over 24mm, the widest part of the pegbox front is 26mm, the distance from the leading edge of the nut to where the neck intersects the top plate is 130mm, and so forth. I lay these out using a metric rule, a compass, and a flexible straightedge. The main straightedge is just a stainless steel ruler with a cork backing that I bought from a fabric store. But I need a very flexible straightedge when I am laying out the curly portion of the scroll, so I cut a spiral strip out of a large soft-drink can (actually it was one of those oversized “energy drink” cans. Someone at work had it, and was going to throw it out, so I snagged it and made good use of the thin aluminum sides.) It is about 40mm wide, and long enough to wrap around the scroll, giving me a clean, smooth curve to scribe in with the pen. Aluminum flashing would work, too, but this was free. You can see the layout lines in the next step. I use the bandsaw, again, to trim all the waste wood from about two inches down the neck up to where the pegbox begins to disappear under the curve of the scroll. I leave the scroll and almost all of the neck full thickness, so that the billet will sit flat on the drill press table, and I can get the pilot holes for the pegs drilled parallel– perpendicular to the centerline of the neck. Another nice thing about leaving the handle portion of the neck for last, is that it leaves me two parallel surfaces, so I can clamp the scroll in a vise, and use both hands to control the gouge, plane, saw, or other hand tool. Front and back profiles laid out– excess wood trimmed form cheeks. You can see, too, that I already began carving the heel (or chin) of the pegbox. Just a personal preference. 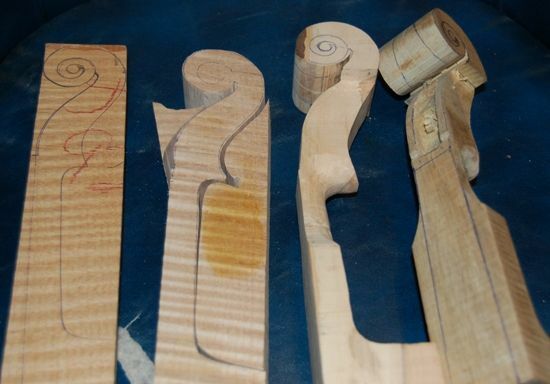 Some people wait until the whole violin is completed, including varnishing, to drill the peg holes, but I find it too difficult to get them parallel with one another that way. If I can drill a 1/8″ pilot hole for each of them, using a drill press, so that they are exactly perpendicular to the center of the neck, I find it much easier to complete the neck later, than if I have to try to get them right with no flat surface from which to reference the perpendicularity of the holes. You’ll see these holes in the next blog post. So long as they get done before I cut the excess wood from the neck and scroll, I will be OK, because the neck will still sit squarely on the drill press table. There are several ways to do this. A lot of makers use a drill to hog out the waste wood from the hole, and then use chisels and gouges to smooth and complete the work. I usually just use the chsels and gouges right from the beginning…one mistake with the drill, and the scroll becomes firewood. I use a narrow, flat chisel to begin the work, and develop some depth, then use a wider, flat chisel to flatten the inside of the pegbox “cheeks,” and to deepen the box floor. I have to be careful to not go too deep. I have (once) cut so deep that, later, when I cut the fluting (volute) from the outside, I cut through into the interior of the pegbox. That is another good way to transform a nice scroll into firewood. Pretty sad when that happens. I tend to begin by carving the outside of the pegbox heel… it makes me feel better about the scroll, if something about it is already starting to look like a finished scroll. Here you can see all four of the preliminary steps, including the beginning of carving out the pegbox. You can see, too, the extra length in the five string fiddle pegboxes (on the right). I will show photos of the succeeding steps in the next blog post. What you see above, though, is the beginning of all those nice violin, viola, cello, bass and five string fiddle scrolls you have enjoyed looking at.